This exciting new cookbook introduces a modern concept in Indian cuisine-it can be simple, quick and delicious. 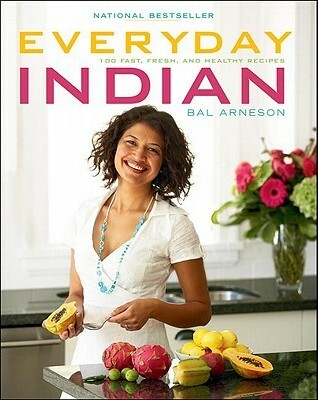 With most of the healthy recipes in Everyday Indian: 100 Fast, Fresh, and Healthy Recipes ready in less than 25 minutes, Bal Arneson proves that Indian cooking doesn’t have to be complicated. Her recipes use everyday spices and common techniques to create simply mouth-watering dishes that the novice cook and experienced home chef alike can whip up at home. Everyday Indian: 100 Fast, Fresh, and Healthy Recipes also offers low-fat options for the health conscious without ever compromising taste. Indian food is simple, quick and delicious with dishes like: Sal’s no-butter chicken. Baked samosas. Whole wheat naan bread. Tandoori halibut patties. New York steak with fennel seeds and ginger potatoes. If you like Indian food, like cooking quick and easy, and are also health conscious, this is the book for you. Most of the ingredients are fairly easy to find, and most of the recipes use more spices than anything else. There are author thoughts for each recipe which give you a look into the private life of the author, and the photos are great. I think this would be a great cookbook to add to your collection. I haven’t made any of the recipes yet, but the one I want to try first is Kidney Bean and Yam Stew with Oranges. Why? Because even though I love kidney beans, yams & oranges, I would have never thought to put them together and I want to see if it’s any good. I’ll post the recipe whenever I get it made. If you try it, let me know what you thought. Place the oil, ginger, garlic and fenugreek seeds in a big pot over medium-high heat and cook for 2 minutes. Add the cumin, garam masala, bay leaves, oregano, rosemary, turmeric and salt and cook for 2 minutes. Add the tomatoes, yams and water, increase the heat to high and bring to a boil. Reduce the heat to a simmer and cook for 7-9 minutes. Add the kidney beans and oranges and cook for 1 minute. Turn off the heat and cover with a lid for 10 minutes before serving. My son loves Indian food, I should get this book. I don’t think I’ve ever had Indian food, but that sure sounds good! I love Indian food. Will have to look for this book. Thanks for the review! Love Indian and this sounds like a good book. Thanks for dropping by and visiting me! I like Indian food, but rarely cook it at home. This cookbook could be my inspiration! Ahh I like fast and healthy and delicious! I wonder if they have roti in this book! Ooh yum! Love Indian food (both cooking and eating). I love Indian spices! This recipe looks easy. I’ll see if my library has this book. This sounds great! I’m a little intimidated by Indian cooking so anything that makes it sound easy is a good bet. Indian food is one of the cuisines I absolutely love eating out, but have never tried making at home. I really do need an introductory course – this book looks like it might be a good place to start. Thanks for sharing! We both love Indian food, although I do tend to put together my own recipes. Any meal which is quick and easy and can be cooked together in one pot, usually does it for me! I am not one for fancy cooking these days. Eating an Indian meal out, is always a rather hit and miss affair, I find. Many of the Indian restaurants are not all that good, so finding one that suits our tastes and sticking to it seems to work for us. Luckily we have a good one not too far from where we live, so not a problem! I love Indian food, and this looks like a book I’d definitely like to add to my collection.